I'm incredibly excited to announce that last Thursday we opened our first Shoes of Prey store within David Jones, Elizabeth St. Sydney! This has been a huge project for us, David Jones and our friends at The General Store who developed the concept and design. And the resulting store looks incredible! 1. Women want to see and touch our leathers, experience the quality of the product and try the shoes on for size. 2. Many potential customers struggle to make a decision on which of their many designs they should buy. Both of these issues we can solve in our store. To solve these two issues, we wanted to create an exciting and immersive retail experience. And in line with the "purple cow" nature of our brand, we wanted something that really stands out. To these ends, the store can be broken into two functions. 1. Drawing people into the store. 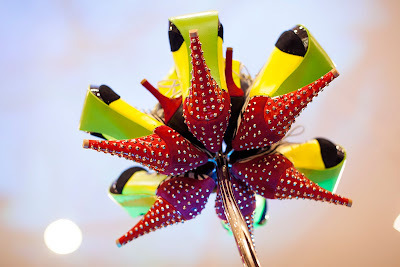 The store features a 2.4m flower sculpture made from our shoes growing out of the large round table which forms the centre piece of the store. The flowers are framed by the large back wall featuring our logo and tag line "Design your perfect shoe". The wall also features some of our shoes with tags on each of them telling you who designed the shoe and where they're from, eg. Jade, Manly or Yuka, Tokyo. At waist height along the back wall are all of our 157 leathers laid out in colour order. 2. Creating an immersive experience. Once we've drawn someone into the store we invite them to sit down at the table where the rest of the experience takes place without the customer needing to move. On the table are 6 iPads which the customer can use to design their shoes. Also on the table are boxes containing swatches of all our leathers that customers can place next to each other so they can see how the different colours and materials will go together. The stools the customers sit on are made from our shoe leathers, as is the black soft leather tabletop. ARIA winning artist Neal Sutherland composed a sound track which plays from the centre of the table, and our very own Shoes of Prey scent also emantes from the middle of the table! When the customer is ready to try some shoes on to determine their shoe size, a Shoes of Prey team member (we staff the store full time) can bring the shoes over to them and the customer can try them on while remaining seated on the stool. This is our first store and it's a trial of offline retailing for us. The store is in the David Jones store closest to our head office so we can spend time in the store understanding and learning what does and doesn't work, with a view to rolling out more stores if the trial is successful. It's incredibly exciting for us to partner with David Jones. David Jones is one of Australia's oldest and largest retailers opening its first store 175 years ago! We're one of Australia youngest retailers, a short 3.5 years old. David Jones have a strong fashion pedigree, their brand has a similar positioning to ours and they've devoted an entire floor of their Elizabeth St. store to women's shoes which is testament to how much they value the space we're operating in. Donna Player and the team at David Jones have been incredible. Doing this deal and our store design broke a lot of David Jones' established rules and ways of dealing with concession holders and without this we wouldn't have been able to operate in the store. David Jones often get a bad rap for their lack of innovation, but seeing first hand their willingness to change and work with us has been an exciting experience, we honestly couldn't have picked a better partner. I also wanted to give a huge shout out to the team from The General Store. I first met Matt Newell at the Supercheap Auto 1000 in Bathurst when I was a budding retail graduate and Matt was working for Supercheap Auto's ad agency. We hit it off and have been good friends since. Matt and his business parter Andrew Fraser have recently launched the retail agency The General Store. 6 months ago we held a 2 day brand development workshop with them which was incredible, so we engaged them to develop the concept and design for our Shoes of Prey store. In addition to facilitating the introduction to David Jones, what they came up with for the store design is nothing other than incredible. The concept of drawing people in, then creating an immersive experience and all the little details that go around this is all their work. We couldn't be happier working with them and can't recommend them to other retailers highly enough. The full team from The General Store who worked on this project: Andrew Fraser (creative partner), Matt Newell (strategy partner), Allister Jennings (interior designer), Tobhiyah Feller (theatre set designer), Daniel Stukel Beasley (architect), Neal Sutherland (musician). And finally, a massive thank you to the people on our team who worked on this project, particularly Dave Knapp who managed the project from our side and at times moved mountains to ensure we got the project up and running. Thanks also to Maria, Lucy, Anna, Marcela, Brigette, Dione and Lydia from our retail and customer happiness teams who put in a huge effort to get the store up and running, and are helping out with working in it, as well as Jessica who has provided lots of sales training. Congratulations to the SOP team! Michael, I've been following your blog since hearing you speak at an ACRS breifing last year - I also operate a company offering "mass personalisation" but in the home / interior design space - we have an online art gallery but with brick and mortar retail partners for similar reasons. I visited DJ's yesterday and checked out the new conecpt - will drop you a message on LI. This is truly amazing and such a fantastic achievement! A big congratulations to the SOP Team! After hearing Jodie speak late last year and following your amazing progress I am not surprised you managed to pull this off. I can't wait to come in-store as well as see what you guys come up with next. Are there ready-made shoes available for purchase at the store?